This Buy Here Feather Flag is a Low Cost Business Promotional Tool! This Banner is Perfect for Businesses of all Types. This Buy Here Feather Flag is In Stock Now! Printed message dyed through for a reverse image on backside. 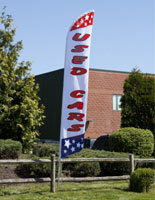 14' Height banner with red, white, and blue color scheme for a highly visible display. 4-piece aluminum pole for low price point and portability. 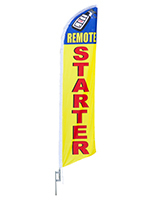 This buy here feather flag that is portable comes with a 4 piece aluminum pole. This inexpensive advertising banner is economical compared to custom printed signage yet has the same results. 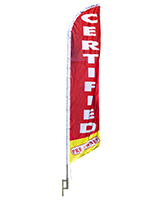 This buy here feather flag that is for outdoor use installs in minutes! This display kit includes everything needed to set up once received. 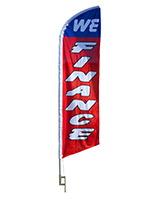 This 14 foot tall buy here feather flag, also known as a sale banner, is sure to demand attention from potential customers. 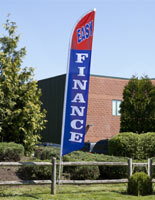 This banner helps set businesses apart in a competitive market. This buy here feather flag is printed on a poly knit material for bright colors and a lasting outdoor display. These swooper kits include a metal ground spike. 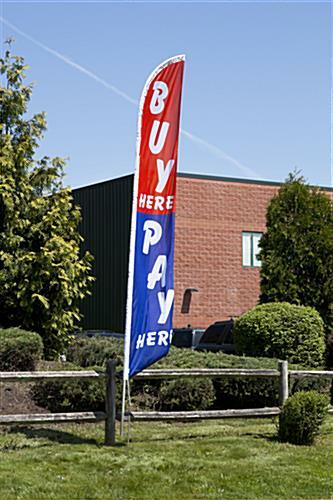 This buy here feather flag is tall and highly visible for an inexpensive advertising method. These sign kits are ideal for auto dealers to inform customers of potential financing options. This buy here feather flag is economical. 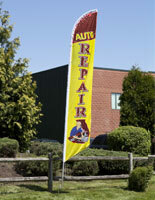 This banner kit uses aluminum poles which are a fraction of the cost of fiberglass. This red and blue buy here feather flag has bold white text for an easy to read display. This low cost business marketing tool can be strategically placed next to the road to attract passerby customers in car or on foot. This swooper banner, buy here feather flag that includes a ground spike is for outdoor installation. This display waves in the wind creating an enticing effect. This buy here feather flag is designed for outdoor use and is portable making it simple to bring inside at night or during inclement weather.